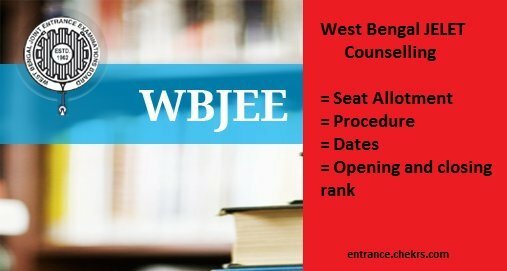 WBJEE JELET Counselling 2018: The West Bengal Joint Entrance Exam Board announced its lateral entry exam (JELET) results on 30th June 20017. The aspirants who have qualified the exam are going to be called for the JELET Counselling 2018. The students will be allotted seats during the counselling process. The aspirants who will be allotted seats in the counselling process, they will be eligible for the WB JELET Admissions. They can also check the schedule, procedure etc here. The WBJEE Board will commence the WB JELET Counselling in the month of July. The aspirants who will join the counseling, they have to follow the JELET Counselling Procedure 2018. The process will include registrations, choice filling, allotment etc. The students have to join the counseling and complete all the procedure for West Bengal JELET Admissions 2018. The aspirants are required to register themselves on the official website for the JELET Counseling. The aspirants who will have a successful registration, only those will be eligible to join the counseling process. The students have to upload their WBJE JELET 2018 Scorecard for the confirmation of their selection. The aspirants have to fill their preferences for the colleges. When the aspirants complete this procedure they have to lock their choices as a confirmation. They can not change their choice after the locking. The aspirants will be allotted seats according to their ranks and choices of colleges. The students who will be deprived of getting a seat can join the next round of the counseling. The aspirants have to pay a fee of Rs. 506 through a challan. The students can download the challan in the month of August before starting of the counseling process. The WBJEE JELET Seat allotment depends upon the opening and closing rank of the counseling. The students can check the WB JELET Opening and Closing Rank on the official website after the declaration of the result. The students who will score a good rank will be preferred first. If students face any problem to registering themselves for counseling they can contact us for their queries.